After growing up in Beijing, China, surrounded by tall buildings, Eugene Zhang appreciates living in a small town. “I like the quietness. It’s great to be close to nature. I really enjoy the fact that I can do things like ride my bike in the country or go berry picking. I was never able to do that in Beijing,” he says. Zhang moved to the US for the educational opportunities, first to Columbus, Ohio where he received master’s degrees in both mathematics and computer science at Ohio State University. “I was really excited about the fact that you could use mathematics to make 3-D shapes, and manipulate them to make things move,” he says. He found a way to combine his academic interest with his new passion — American football. Although he initially didn’t understand the game at all, he caught the bug when he realized that Ohio State was a football powerhouse and started following all the games. Thus, one of his first animation projects simulated a spinning football during a kick-off and the bounce when it lands. He had moved on to be a software developer in Greenville, South Carolina when he realized he missed working in animation. But a new interest was now keeping him in Greenville — his soon-to-be wife, Yue. So, he applied to schools close-by and was accepted to the PhD program at Georgia Institute of Technology in Atlanta — only 150 miles away, and one of the top schools for computer animation. Advances in 3D graphics have made movies and video games more realistic, but can also have an impact on science. Eugene Zhang and Yue Zhang describe their research in this podcast to help medical doctors better target cancerous tumors by using 3D modeling and simulation. 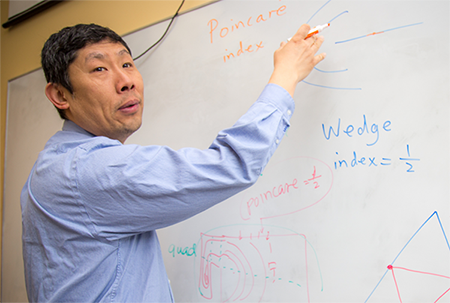 There Zhang’s focus changed a bit when he began working in geometric shape modeling. His graduate work pioneered the area of vector and tensor field design which uses mathematics to improve the artistry of computer images. His work allows users to better control factors like the path of a brush stroke to create contrast or a more dynamic expression such as in a van Gogh painting. Another application for his work is computer generated painting where users can select different parts of a picture or video and select a painting style, such as impressionism, to alter the image. 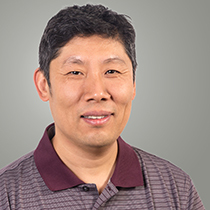 Since coming to OSU Zhang has initiated research in the area of scientific visualization that aims to help scientists understand data like the movement of particles (such as wind or water), and objects under stress (such as plate tectonics). For these projects he has collaborators in various fields studying topics such as weather prediction, tsunami simulation, and earthquake engineering. “Scientific visualization is essentially a way of using computer graphics to generate images that trigger human cognition. So, the images we create are not anything you would see in nature, but something like a temperature map with colors that indicate hot versus cold to help people better understand the data,” Zhang says. The work earned him one of the most prestigious awards for new faculty — the Early Career Development Award from the National Science Foundation given to the most promising scientists at the beginning of their career. But one of the greatest rewards of his career is, he says, watching his students learn and grow, and getting the chance to learn from them. Off work, he enjoys watching his children grow up and playing badminton and basketball with them. He also enjoys playing Go, an ancient Chinese board game that has received much attention thanks to AlphaGo, a computer Go program based on deep learning. "There are great opportunities to combine computer graphics with Go and deep learning," he says.